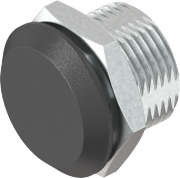 The blanking plug, made of zinc die, is designed to cover cut outs that are not used anymore.Two additional versions made of polyamide and with an internal plug complete this solution that now enhanced our standard catalogue program. The polyamide versions can either be screwed in or clipped-in for quick assembly. Share the post "Program 1000 Blanking plug for unused lock holes"